When the Durango & Silverton Narrow Gauge train races the riders in the Citizens Tour this year, 80 veterans, wounded warriors, Gold Star camily members and Adaptive Sports athletes will be on the train. Well, the event is Memorial Day weekend, after all. With that in mind, the Iron Horse Bicycle Classic and sponsors have set up something special this year to honor the holiday’s purpose: Eighty seats on the Durango & Silverton Narrow Gauge Railroad that races Citizens Tour cyclists will be filled by wounded warriors, veterans, Gold Star family members and Adaptive Sports Association athletes. 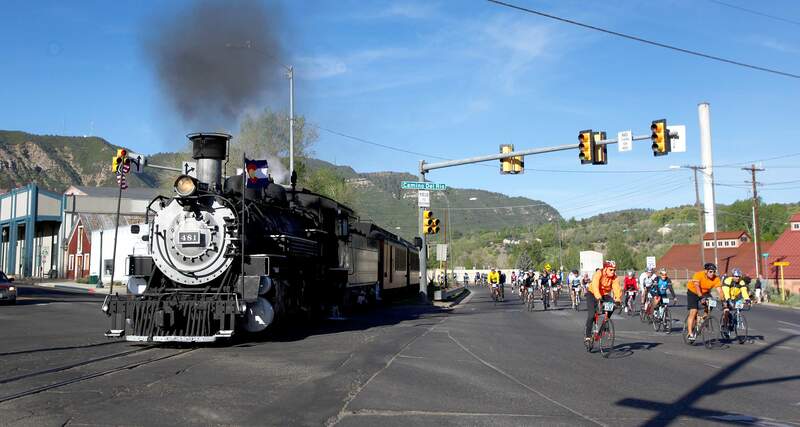 The train will depart from Durango at 8 a.m. May 23, its whistle being the honorary signal for the cyclists to begin pedaling. A quick refresher course: Memorial Day – May 25 this year – honors U.S. soldiers who have died while serving. It originally was called Decoration Day when created after The Civil War. Janna Schaefer, with the Disabled American Veterans, said she has had no trouble filling the 80 spots with people who qualify to ride the train and already has established a waiting list. Several local luminaries will be part of the train ride and festivities, which will include a lunch in Memorial Park in Silverton and a planned military-jet flyover in Silverton. Among them are retired Air Force Gen. Ron Fogleman, with his wife, Miss Jane, and former U.S. Sen. Ben Campbell and his wife, Linda. Schaefer, whose husband, Air Force Staff Sgt. Stephen Schaefer, died because of ailments suffered during Desert Storm, also will ride the train. “It adds a new group to Iron Horse weekend,” Sippy said. The 80 seats are being sponsored by the Iron Horse committee, Mercy Regional Medical Center, the D&SNGR and the Hampton Inn. Gold Stars are given to family members of those soldiers who have died in military operations. Adaptive Sports Association, a nonprofit operated at Purgatory Resort, serves those with mental or physical disabilities. Those wishing to help sponsor or help with the event can email Pam Glasco at sponsorship@ironhorsebicycleclassic.com. General registration for the Citizens Tour sold out in December, but it’s still possible to enter through the Iron Horse’s charitable partners. A few road-race categories still have openings. Other weekend events are still open.